Thomas O’Brien’s Hallings Secretary: Can’t Get Enough! 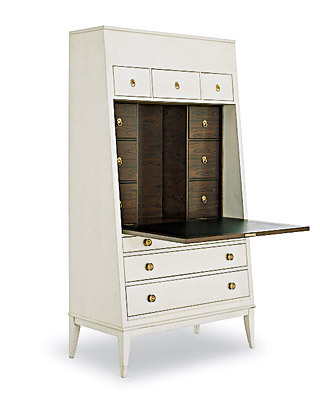 I first swooned over the Hallings Secretary by Thomas O’Brien when I saw it in the Hickory Chair showroom in High Point, NC, when it was introduced at the International Home Furnishings Market several years ago. The Hallings can be ordered through Colony House in Arlington or And Beige in DC. To the trade, it's available at the Henredon showroom in the Washington Design Center. But as I was going back through my old files, I realized that it’s cropped up no fewer than three times in publications I’ve been involved with producing — all from different designers. So I guess they are as fond of it as I am. The first time I saw it in situ was at a home in Vienna, VA, where Designer Liz Levin used it in a master bedroom. 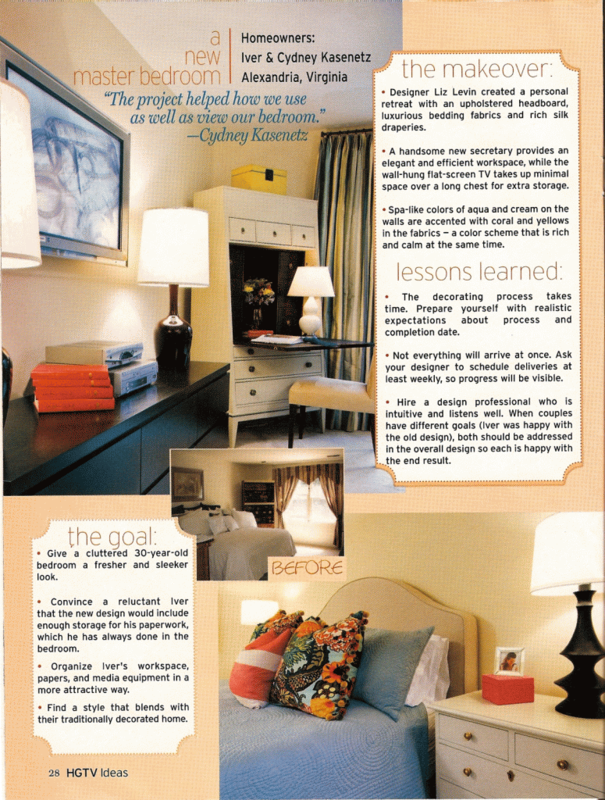 We featured it in HGTV Ideas magazine. Then, when I signed on with Washington Spaces in 2008, Designer Craig Henson used it in an airy den for the DC Design House. Ron Fiore, creative director at Hickory Chair, said in an interview with the blog Life in a Venti Cup last year that of all the pieces at his company, the Hallings is his favorite: “Hands down it has to be the Hallings Secretary from the Thomas O’Brien Collection. That piece just works……..with anything,” he said. Fiore, a tremendously affable and entertaining man whom I’ve met myself, is certainly in good company. Mary, get out! That is so cool. Thanks for letting me know — I must go see it soon. This is one of those perfect pieces you can move from room to room and it always look right. And, Thomas O’Brien…hmmm…he can do no wrong! Indeed, Liz! I’m so glad you saw this — I was going to email it to you. What a fond memory! I still love that piece… our first date! Thanks for sharing the images. I have to admit, when I saw the product alone it didn’t “wow” me. But, to see it in beautifully decorated rooms….you changed my mind! What a phenomenal secretary. Mentioning HGTV Ideas magazine brings back fond memories. I was a loyal subscriber until they ended their tenure in the print media business. I saved every issue but when we moved, I tossed them. Boy, do I regret it! Oooh How I love this secretary! Nice contrast against the dark floors.